Even though I grew up Catholic, I must confess that I was a bit nervous with the thought of working with religious orders while completing my year as a volunteer in an Augustinian program. To add to my nervousness, I was going to spend almost a full year in Peruvian society in a small city where the setting was going to be a very different one than my liberal arts university. My discomfort towards the religious affected my view of the Catholic Church’s role in God’s will and affected my Catholic identity which, eventually, affected my relationship with God. This attitude soon changed with every interaction I had with the religious as a volunteer. Almost from the start the stereotypes I had of the religious where challenged with my first interactions with the Augustinians and their novices in Lima. Their openness and lack of shyness on controversial topics caught me off guard plus their genuine care on each person’s opinion during conversations. Another stereotypes I had was that due to joining a religious community the personality of a person was subdued to the point that there a lack of self-expression and opinions. I soon came to realize that every person in a religious community that I met still retain their personality and unique view of the world. This made meeting the religious a unique and eye-opening experience. 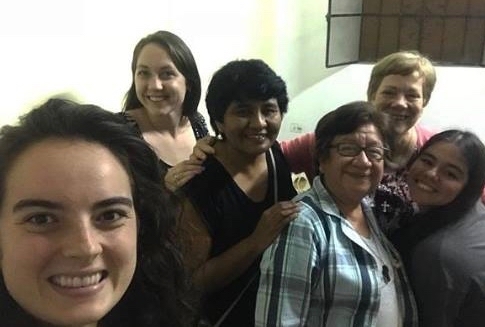 From the Augustinians in Philadelphia, Lima and Chulucanas to the Sisters of Mercy in Chulucanas all these encounters have given me a new-found respect for those individuals that decide to join a religious order. Not only a new-found respect but also an admiration towards those individuals that decided to leave society and join a community. All of these amazing individuals had an ever-growing hunger to serve others which lead them to dedicate every aspect of their life for God’s will and hope of spreading God’s love, generosity, compassion and the good news to all those who they encounter. Bishop Dan, the bishop of Chulucanas, is a perfect example and a refreshing one, as well, of a bishop who puts all his blood and sweat to his community even as he nears retirement. He travels to every region in Chulucanas even if at times there are only two people attending mass in the small rural towns. This man is almost a living saint and I would not have guessed I would have the honor to meet such an incredible individual who only wants to serve the people and to do God’s will. I often thought that this discomfort towards religious was not affecting my relationship with God, but I soon realized that was not the case and coming to Peru has helped me realize that. I never realized how much my views would be challenged forcing me to reflect on why I developed the views that I held. The interactions with religious made me understand that God can hold incredible experiences for his beloved children. And the most amazing thing is that you will never know what those experiences are, and the reason why but only learn from it and grow as a person.